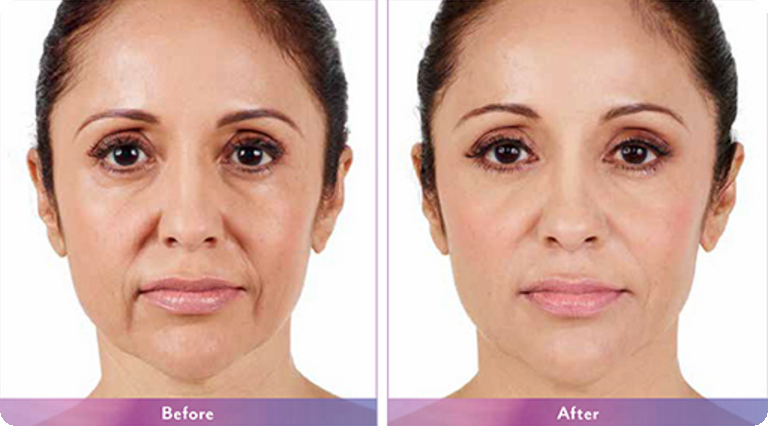 Juvederm Ultra XC in Rancho Cucamonga is now available at True Beauty Aesthetics. Dermal fillers are a group of non-toxic substances that are injected under the skin at various depths to smooth out fine lines, deep wrinkles, nasolabial folds, and acne scars, volumize and define lips, contour the chin and nose, or plump up sunken cheeks or temples for a full, lifted appearance. Juvederm Ultra Plus is made with a hyaluronic acid gel. “Hyaluronic acid is a sugar that’s found naturally in your skin and makes your joint spaces feel slippery. Its function is to absorb water, deliver nutrients and act as a cushioning agent. So when you inject it into your skin, it acts like a sponge and expands to fill in wrinkles and folds and support sunken areas,” explains Dr. Sina who specializes in cosmetic dermatology in his Rancho Cucamonga boutique clinic. The extra water brought to the skin’s surface also imparts a fresh, glowing radiance and a soft, supple skin texture. These injections induce a robust production of collagen, which helps to further firm and plump your skin and reduce wrinkles over time. Juvederm® Ultra Plus treatments in Rancho Cucamonga show results on all skin types and skin colors, but are ideal for those seeking to smooth deep wrinkles and folds, and plump areas with moderate to deep skin depression or fat loss. They are also ideal for those seeking to rejuvenate the skin on their hands. In rare cases, small bumps may appear under the skin at the injection site. If they don’t dissipate within a week, check back in with your doctor. Dr. Sina will make sure that you reach your goals by applying Juvederm Ultra XC in Rancho Cucamonga at True Beauty Aesthetics. Each patient is different. Therefore; we recommend you to consult with Dr. Sina for Jevderm Ultra XC in Rancho Cucamonga.